Soak clams in salted water for 15-20 minutes to remove any excess dirt and mud. Rinse under running tap water and drain well. Heat sesame oil in a wok and sauté ginger and bird´s eye chillies until fragrant. Pour in chicken stock and add tong kwai and seasoning. Cook for 6-7 minutes. 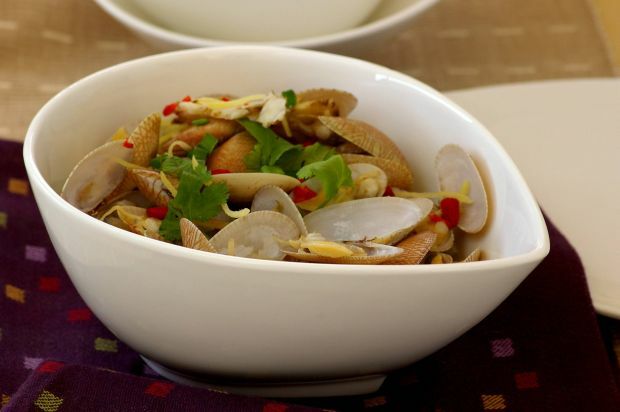 Put clams on a deep heatproof dish. Pour the sautéed ingredients over. Sprinkle over kei chi and steam over rapid boiling water for 8-10 minutes or until all the clams have opened.